Finding what I needed in the seasonal aisle, I tried not to run to the front of the store to pay. I imagined the ants swarming over my kitchen floor, turning it an undulation of black, looking for some scrap of food to pounce upon. I scratched behind my ear, flicked something imagined off my top, when out of the corner of my eye, I saw the nemesis of my childhood. The ant bait I clutched went forgotten as the quicksand of memories sucked me in. Like every stupid damsel in every stupid horror flick, I wasn’t strong enough to ignore what I knew might be my downfall. I picked up the soap, the weight of it all too familiar in my hand. I felt the brick through the wrapper, the ridged edge framing the soap, the imprints of the letters along the center of the bar, and the folds of the paper, like gift wrapping, with the final side forming a blunted triangle where the edge met the end of the bar. 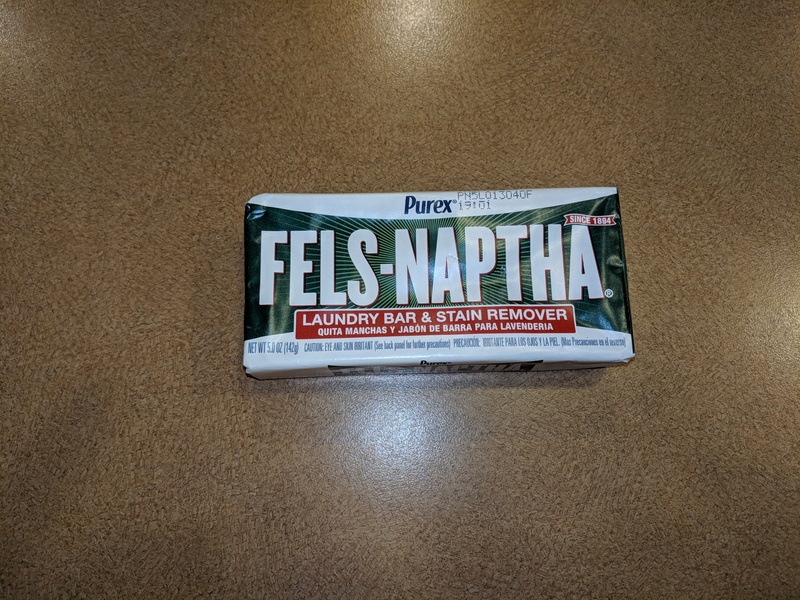 I remembered the times my mother made me get the bar of Fels-Naptha and how I’d rub the paper the same way, feeling every edge, knowing exactly what was in store for me. My mother would point to a chair she had placed in the middle of the kitchen. I’d climb aboard, my legs too short to reach the floor, so I’d swing them back and forth, as if I didn’t have a care in the world. Sometimes I would glare into her eyes, daring her to do her worst, but that always netted a heavier toll. She’d command “open,” and if I was truly sorry for what I’d said, I’d dutifully open my mouth and let her scrape the soap against my teeth, leaving shards to fall into that delicate space under my tongue. I’d leave my mouth open, letting the spit build up until she saw the foamy mess and told me to go and rinse. But times when I was still angry, I’d shoot daggers into her face and refuse to open my mouth. She would grab my jaw and squeeze until I couldn’t stand it a second longer and my mouth would pop open. Despite my best efforts to plaster my tongue to the back of the bottom row of my teeth teeth, she’d push it away with the bar, sawing it back and forth, making shavings that fell under my tongue. I’d try so hard to scoop it out and push it away, but each time I tried, more melted, and soapy saliva pooled into that deep well under my tongue and threatened to drown me. I’d swallow, tasting the soap and smelling it as it went down. One time as we prepared to go to grandmother’s house, I’d apparently mouthed off or refused to help which made my mother angry. She stopped her preparations, and went and got the soap herself. She popped my mouth open and began scraping shards of soap against my teeth while yelling directions at my brothers. Intent on her commands, she kept sawing back and forth until I yanked my head out of her hand. Distracted, she walked away and continued to get ready to leave. I sat there, trying not to swallow – blowing air through my mouth to dry up the spit, all the while seething. My brothers ran to do my mother’s bidding, grabbing coats from the closet. My little sisters waddled back and forth while my mother tried to get them in their fancy clothes. They cried and fussed as she pushed their feet into their white lace up shoes. My mother looked up and yelled for me to put on my coat. The soap had foamed so much, I couldn’t talk to ask if I could spit. Soap pulled under my tongue, gagging me until the froth pushed into the back of my throat. I wanted to spit, but that plan evaporated as Dad grabbed one of my sisters by the hand and me by the collar and ushered us out to the car. I rushed to keep up, hoping that if I didn’t have time to rinse, I could at least spit on my way out the door, but the soap continued to pool in my mouth as I lost my nerve to rebel. Too scared to spit on the pavement, I climbed into the back of the car, trying not to swallow. I sat silent the entire thirty minute drive. Soap and spittle began to seep past my lips. My oldest brother shook his head and turned the other way as the foam oozed past my lips. I bit back tears, knowing I’d end up swallowing while trying not to sob. Instead, I looked out the window, wiping my mouth on a sleeve, hating my family. When I climbed out of the car, mom caught the look on my face and rushed over, crouching down so she was at eye level. I gathered up all the spit and soap in and spat on the sidewalk. I could tell she felt bad, but I was too hurt to care. Without saying a word, I wiped my mouth again while glaring into her eyes and marched up the stairs. That was the last time she ever washed my mouth out with soap. I stood in the aisle at Dollar General, ant killer in one hand, childhood victory in the other, and smiled at the memory, trying hard not to itch and even harder not to spit. To read more of our author’s posts, click here. This entry was posted in Elaina and tagged ant bait, childhood memories, family, family life, memories, parenting, soap, Spit or swallow. Bookmark the permalink. Wow! Elaina, I’m elated to see that you’re writing again. This piece is beyond awesome. I wish your life wasn’t so busy so that you could display the magic of your words, one of your many talents, even more.